This is solely for members of regiment. As a reminder to the the members of the regiment attending a Post-Secondary institution, there a two scholarships available with the deadline being 23 March 2018. Apply through your chain of command immediately! The King’s Own Calgary Regiment (RCAC) Regimental Funds Foundation has established the Captain Arnie Charbonneau, MC Scholarship after a generous endowment by the Charbonneau family. Arnie Charbonneau was an accomplished athlete, a member of two Grey Cup winning teams prior to his enrollment in the 14th Army Tank Regiment (The Calgary Regiment). He was awarded the Military Cross for his actions at the Battle of Motta Montecorvino in Italy during World War II. In recognition of Captain Charbonneau’s athletic and military achievements, an annual scholarship of $5,000.00 has been established to be awarded to an athlete of outstanding skill and demonstrated teamwork from the Regimental Family of the King’s Own Calgary Regiment. The Regimental family includes serving reservists, veterans of the Regiment, a serving cadet in a cadet corps affiliated with the Regiment (2512 RCACC), a direct descendant of a King’s Own Calgary Regiment veteran, a volunteer with either the King’s Own Calgary Regiment Museum, Regimental Association or Regimental Funds Foundation. 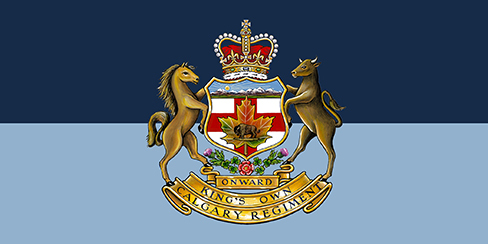 The King’s Own Calgay Regiment (RCAC) Regimental Funds Foundation has established a bursary to be awarded to deserving applicant(s) from the Regimental family who have committed their time to support the Regimental Family’s activities. The bursary amount is $1,000.00. The applicant must be registered to a recognized post secondary full time or part time program that will lead to a degree, diploma or certificate for which a tuition fee has been or will be assessed. The Regimental family includes serving reservists, veterans of the Regiment, a serving cadet in a cadet corps affiliated with the Regiment (2512 RCACC), a direct descendant of a King’s Own Calgary Regiment veteran, a volunteer with either the King’s Own Calgary Regiment Museum, Regimental Association or Regimental Funds Foundation.